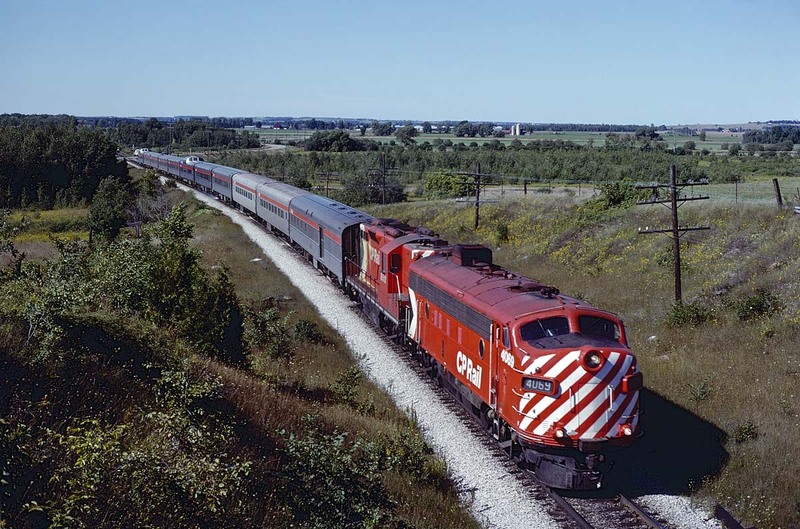 Railpictures.ca - Dave Beach Photo: CP FP7 #4069 leads GP9 8512 and the 10 cars of the Toronto section of The Canadian through the rolling landscape near Bolton, ON on 9/4/1978 | Railpictures.ca – Canadian Railway Photography – photographie ferroviaire Canadienne. It was “good old days” for trainspotters, but not quite so good for paying passengers. By this time the interiors were getting shabby; the steam heating system was past its “sell-by date” and the dining car food not nearly as good as it was pre-1972 nor as it became post-1992 on VIA. There were many good points, however: the diner still had real silverware; the train ran daily and usually on time; and the fares were reasonable. As with most change: some good, some not so good. Yes, the good old days for sure, Arnold. Smart looking train and an active pole line. Sweet scene. Such a majestic clean scene. The good old days.